The Social Psychology of Expertise offers an integrative perspective to the analysis of experts and expertise in organizations, social roles, management, etc. It is the first book to link the psychology of expertise to sociology, particularly the sociology of professions. 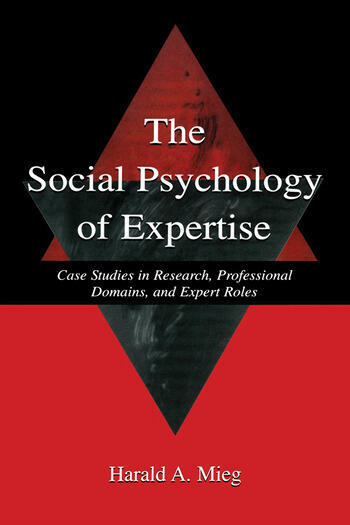 By examining the converging elements of both approaches and investigating the conditions of interactions with all types of experts, The Social Psychology of Expertise makes it possible to understand the market form of expert services. *defines the limits of human expertise in predicting climate change. Contents: Series Foreword. R. Hoffman, Preface. Introduction. Where We Should Start: Cognitive Economics. Essentials of Expertise-in-Context: "The Expert"-Interaction. In a New Light: Organizational Role Conflicts With Experts, and Their Resolution. Case Study I: Experts--Risk--Financial Markets. Case Study II: Predicting Climate Change 1988-1997. Conclusions for the Conceptualization of Expertise-in-Context: Types of Experts, Uncertainty, Insecurity. Conclusions for Management With Experts: The Expert Role Approach. "Mieg works from a foundation in psychology and an interest in sociology that recognizes the importance of both the intrinsic characteristics associated with individual expertise and the role that social recognition plays in defining expertise."